The series consists of three distinct games that go by the name of Wolf Pack, Bengal Tiger and Giant Panda and they are all available at Ladbrokes Casino. Each of them is centered around a mighty beast and although it might appear like the similarities between them outshine the differences, they are all unique and worth playing. There are 243 ways of winning when playing Untamed Wolf Pack and the action takes place in the endless Canadian forests, whose image is greatly enhanced by state-of-the-art graphics. This slot game just like the other two in the untamed series has two unique features known as Running Wilds or the Collect-A-Wild. Tokens and free spins are awarded doing these special rounds, adding even more opportunities to win without increasing the amount wagered, hence taking additional risks. Untamed Bengal Tiger suggests a dramatic change of decor, with players being transported to the tropical jungles where the creature leads. The game mechanics are not very different but the Lucky Nudge and Gamble features provide players with the impetus to persevere, regardless of their former experience with the untamed series. 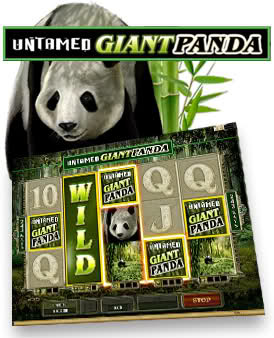 The Gamble function transcends the three games and it is also present in the third title, so you won’t be missing out on potential profits by shifting to Giant Panda slot game. This feature caters for high risk takers who are presented with the option of increasing the chances they take for the sake of extra profits. If they are not satisfied by the payouts generated by the Collect-A-Wild and Trailing Wilds features, there is always the option of resorting to this rather risky function to maximize returns.